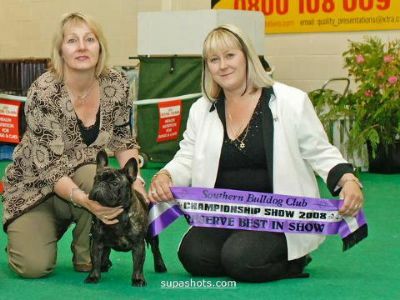 Monty has had a limited show career but made a great impact taking out Best French Bulldog and Reserve in Speciality Show at just 10 months of age. 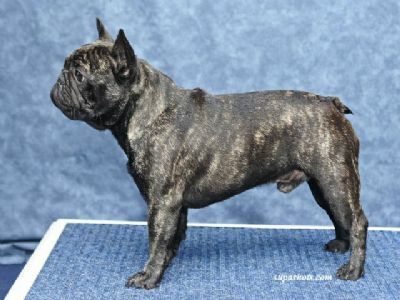 He has great bone, huge ears, dark eyes and a fantastic personality to match his looks. Monty gained his Championship title 3 days after his 1st birthday. Our wonderful boy is now living in Australia and being spoilt rotten by his new 'people'. He has done well in the show ring so far and we are so pleased that he is continuing in Australia the way he started in NZ. 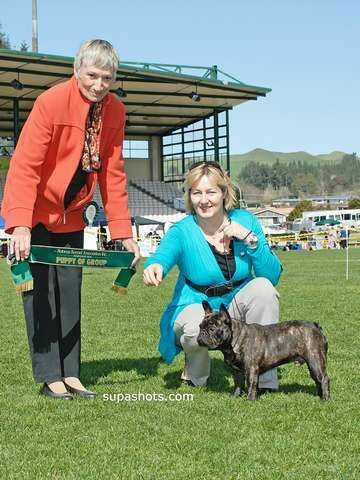 Monty's progeny are doing very well in the show ring here in NZ with his son being the only French Bulldog to go through to the Nationals. A Monty daughter won Puppy in Show at the recent Speciality Show and another Monty daughter won Novice in Show at the same Speciality Show.